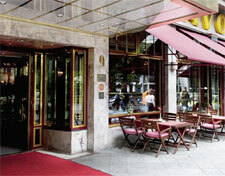 Opened in 1929, the hotel Savoy Berlin lies just a few minutes' walk from the busy Kurf�rstendamm, Berlin�s famous elegant promenade. Celebrities like Maria Callas, Romy Schneider, Greta Garbo, Helmut Newton and the famous German writer Thomas Mann were regular guests. They all valued the hotel�s atmosphere and unobtrusive service. Today the Savoy is still synonymous with style, discretion and hospitality. Friendliness and comfort have been the mark of the Savoy Berlin for almost seven decades and make it very special among the four star hotels. Experience an establishment of the first class category with a classical ambiance, great charm and very personal service. The Savoy offers 125 rooms and suites in three categories.